A feather was added in the Faculty of Creative Industries (FCI) Dr S. Rajini Kumar’s cap when he won the Best Oral Presenter Award for his research titled “Effectiveness of Persons with Disabilities Act 2008 and Elections Act 1958 in Protecting Visually Impaired Person’s Freedom of Expressions in Casting Votes” under the Social Sciences category at the International Conference on Science Technology and Social Sciences 2018 (ICSTSS). The conference was held at the Vistana Hotel in Penang from 3 to 4 November 2018. Themed ‘Redesigning Education for Industrial Revolutions’ the conference was organised by University Teknologi MARA (UiTM). It is aimed at strengthening the collaboration between academics and industries in South East Asia as well as providing them with a platform to share their research outputs, information, knowledge and activities in the various disciplines of sciences, technology and social sciences. 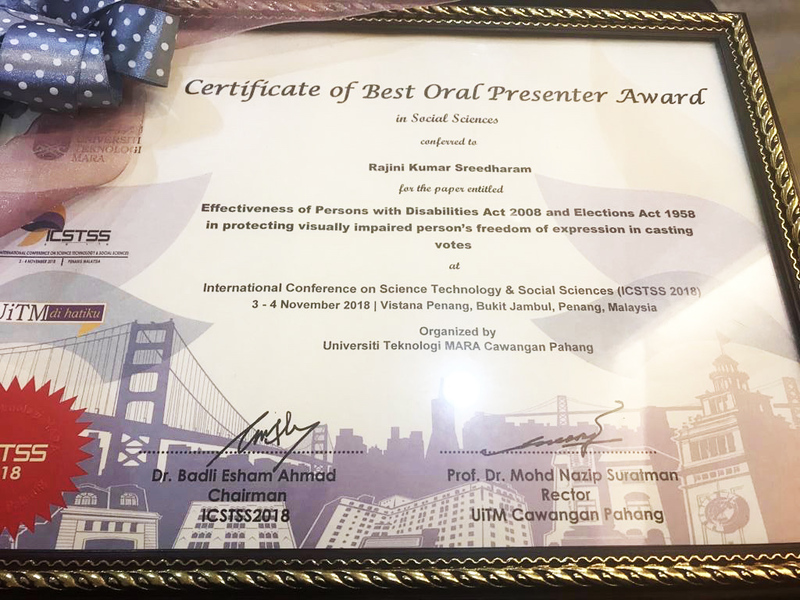 Dr Rajini won the Best Oral Presenter Award and walked away with a certificate of participation. The conference saw a total of 146 paper presentations. The objective of his research is to study on the effectiveness of Persons with Disabilities Act 2008 and Elections Act 1958 in protecting visually impaired person’s freedom of expression in casting votes. The research has also included the experiences gained by individuals with visual impairment in the General Election 2018. The findings of the research will help the government to improve the existing Acts in order to protect the interests of individuals who are visually impaired. “I have joined this conference to position myself as an expert in the area of constitutional law and freedom of expression. Apart from educational and research opportunities, the conference also gives me a great opportunity to build networks with peers. By participating in the conference, researchers may get exposed to new ways of conducting research and help them to discover on how to be more productive,” explained Dr Rajini. Dr Rajini is a Social Scientist and Leadership Coach. He is highly specialised in consultancy and expert in solutions management with a strong capacity to conduct independent research and accreditation process. His many successful collaboration portfolios between academia and industry proved to encourage innovation and inspire creativity in education. Over the past 13 years, Dr Rajini has worked with hundreds of corporate leaders and employees by helping them achieve effective internal and external communications. His expertise reaches approximately 15 corporations across all industry platforms, including the Cabinet, Constitution and Inter-Government Relation Division of the Prime Minister’s Department, the Judicial and Legal Training Institute (ILKAP), AIA Sdn Bhd, the Fire & Rescue Department of Malaysia and Telekom Malaysia. 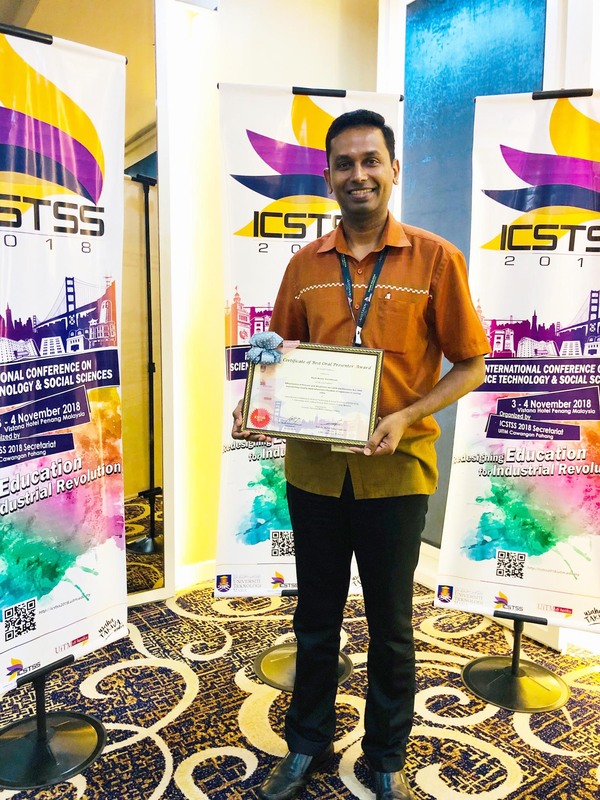 Besides the 17 years of progressive teaching experience fostered his doctoral work on the relevance of sedition laws to control bloggers’ free expression in the digital age. In 2012, the National University of Malaysia (UKM) named him as a co-researcher of government-funded research analysing freedom of information indexes in the Klang Valley region for two years. Consistently honoured by the Manipal International University (MIU) for his strategic intellect on companies and commercial laws, Dr Rajini has served as its trusted advisor for MoU drafting since 2013. He has published a number of papers in the local and international conferences in the area of Sedition Law, Hate Speech and Freedom of expression which involved new media.